Posted 11/5/2018 3:58pm by Shiloh Avery. I went to a luncheon and talked about “self-care” today. It’s all the rage, you know. And not for bad reasons. It was nice to get off the farm for a change. How’s that for self-care. You know, whoever the wise (arse) was that said, “if you love your job, you never work a day in your life”, he or she was definitely not a farmer. Because I can attest that loving your job and working at your job are not mutually exclusive. And we. Are. tired. We have a plan to not work so much beginning now until we really kick it back into gear in February and March. We divided up the work between the three of us so that we can produce all winter long while still having our winter rest. Plus, it’s mostly inside structures so we don’t have to suffer the whims of mother nature quite as much. It’s a well laid plan. You know, of course, what they say about the best laid plans… But now that I’ve talked about self-care as a farmer to other women, it’s time to really focus on that for ourselves. Winter is a time for resting, rejuvenating, healing our bodies and spirits. It’s a time to renew our love for our job so we can come at March with the same ferocious enthusiasm you’ve come to know us for. We’re lucky in so many ways. 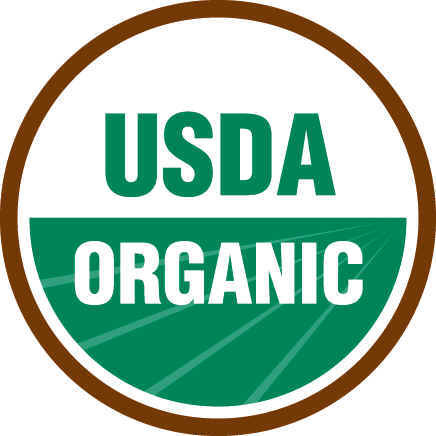 The seasonality of agriculture, even with some winter production, allows for a period of reflection and planning. How many other businesses get to slow way down to do these things. Most businesses just keep on rolling full speed. I wonder how y’all incorporate self-care into your busy lives. Winter Harvest Shares begin next week! We still have a few shares available. 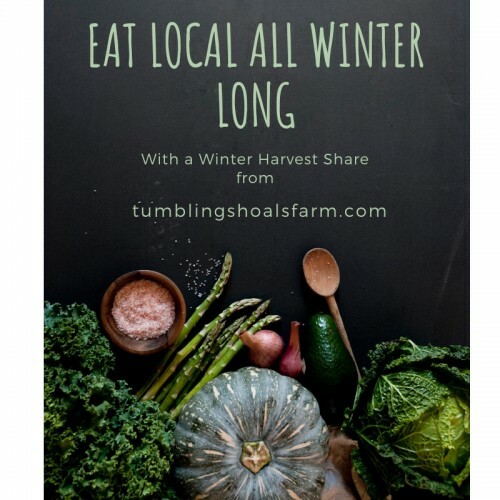 This one size fits all share acknowledges the extra time you'll be spending in the kitchen with family and friends for the holidays and includes a weekly dozen eggs from our dear friends at Creeksong Farm in Ashe County. The winter harvest share begins November 14th and runs through Jan 23rd (with no deliveries December 26th). That's 10 weeks worth of local organic veggies! In the winter harvest share you can expect to see (in addition to free range eggs) salad mixes including lettuce and arugula and some spicy mix, tomatoes, potatoes, sweet potatoes, radishes, Hakurei salad turnips, bok choy, kale, chard, collards, celery, carrots, spinach, and even a bit of turmeric. These winter shares will be limited in availability so get registered as soon as possible! Posted 11/2/2018 1:13pm by Shiloh Avery. Posted 10/30/2018 2:02pm by Shiloh Avery. 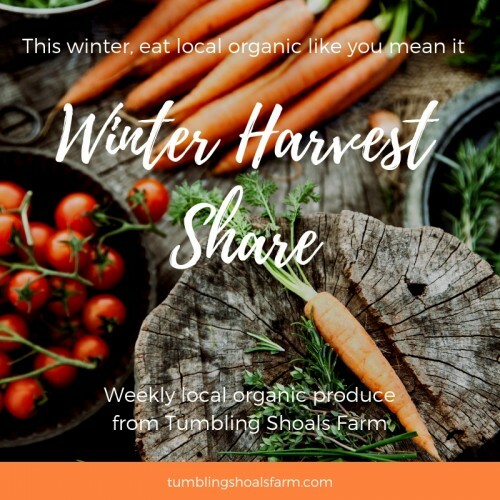 Introducing our new winter harvest share! Mallory has agreed to stay with us this winter so we're growing all winter for you! 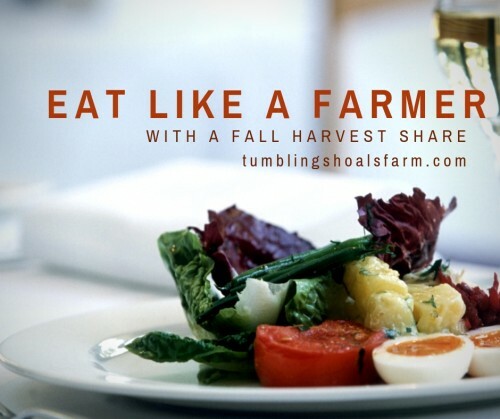 This one size fits all share acknowledges the extra time you'll be spending in the kitchen with family and friends for the holidays and includes a weekly dozen eggs from our dear friends at Creeksong Farm in Ashe County. The winter harvest share begins November 14th and runs through Jan 23rd (with no deliveries December 26th). That's 10 weeks worth of local organic veggies! In the winter harvest share you can expect to see (in addition to free range eggs) salad mixes including lettuce and arugula and some spicy mix, potatoes, sweet potatoes, radishes, Hakurei salad turnips, bok choy, kale, chard, collards, celery, carrots, spinach, and even a bit of turmeric. These winter shares will be limited in availability so get registered as soon as possible! Posted 10/22/2018 7:00pm by Shiloh Avery. Posted 10/8/2018 6:39pm by Shiloh Avery. In my youth I spent some time in various African countries. 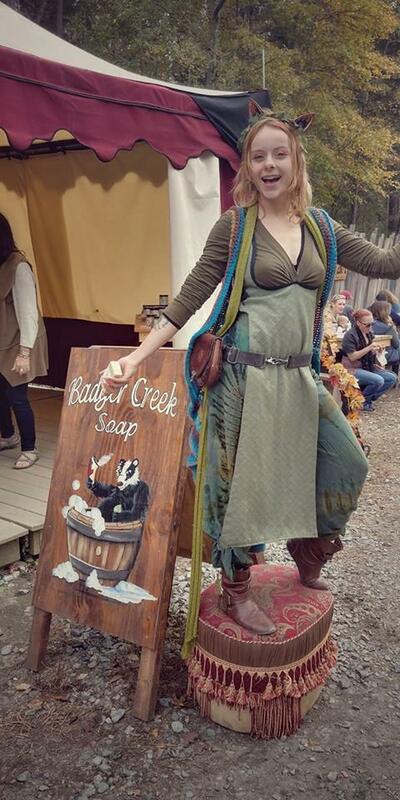 While vastly different from each other the common thread I found was a much slower pace of life. My “busy” times were akin to the slower times here. You still had time to sit and drink tea with the neighbors, or take a leisurely walk, or read a book. Here, those things are seasonal. I checked out my first book from the library since March or April. 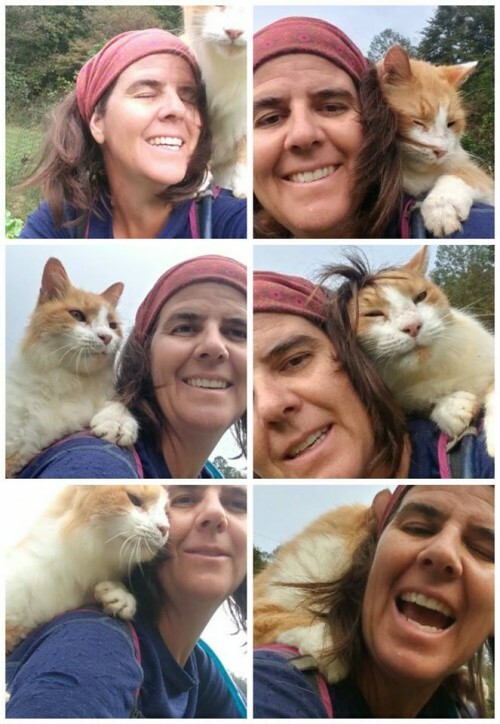 Chairman Meow stopped me in the middle of work to snuggle and take some selfies. All things being seasonal, we are entering into the slow(er) season. When the sweaters come out of the closet and the shorts go in, when the pets want petted, when there are things that need celebrated (birthday, anniversary, Halloween..). This is the time when our laser focus fades and we pay attention to other things, including ourselves and each other. Nothing feels like a crisis as all the planting has been done (almost), and deconstruction activities happen on a flex schedule. Welcome, my friends, to October. Let’s down-shift. Remove tough stem and chop collard greens. Melt bacon grease in the pan, add chili pepper, stock and water, bring to a boil. Add collard greens, return to a boil, reduce heat and simmer, covered, for 30 minutes. Remove cover, simmer to reduce liquid so that less than 1/4 inch remains in the bottom of the pan. Meanwhile, mix honey and vinegar. Add mixture to collards and cook an additional ten minutes. A reminder that there will be no Saturday Hickory farmers market this week due to Octoberfest. Regular market hours in Hickory on Wednesday (rain or shine) and Boone on Saturday. Posted 10/1/2018 4:50pm by Shiloh Avery. 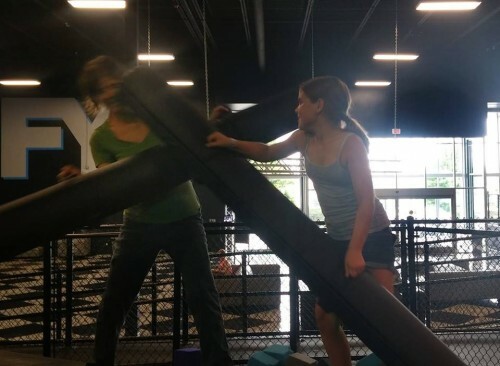 I spent the last several days at play with my nieces, brother and sister-in-law, and my parents. You know how you might tend to worry about a recent retiree—that they might feel lost without the work, that they might petrify. Well I learned long ago from my father, who retired early at 55, that play is powerful. I watched him thrive in retirement because of play. He lives for play. And so did I these past days. In the words of Jill Vialet, founder of Playworks, a non-profit company that works with schools to design curriculum and activities that offer play opportunities during recess, lunch and after school programs, “play gives us a brief respite from the tyranny of apparent purpose.” Ha! I love that. By this point in the season, with the intensity of the season behind us, farm work can indeed feel like tyranny. And so the arrival of play in my life was well timed. 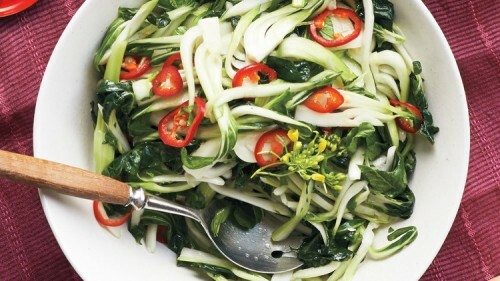 Toss together bok choy, vinegar, both oils, and chiles in a large bowl. Season with salt. Let stand until bok choy collapses to half its volume (it will darken slightly), at least 20 minutes. Toss again before serving. Posted 9/25/2018 2:42pm by Shiloh Avery. I’m not an every day coffee drinker. 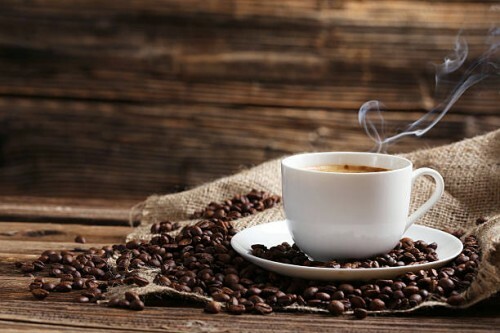 You see, I need coffee to be effective for me on those 4 a.m. Saturday mornings and if I drink it every day, it will be less effective. Or at least that’s my theory. But days like yesterday and today (and tomorrow) increase my coffee need: Heavy days that push on your eyelids so you feel like you’ve never fully woken up. Days where time is tracked only by clocks instead of the movements of the sun. It’s days like these where I need to drink coffee just to exist in the world- the chemical sunshine. Use an inverted spoon to scrape off the thin, paper bits from the ginger. 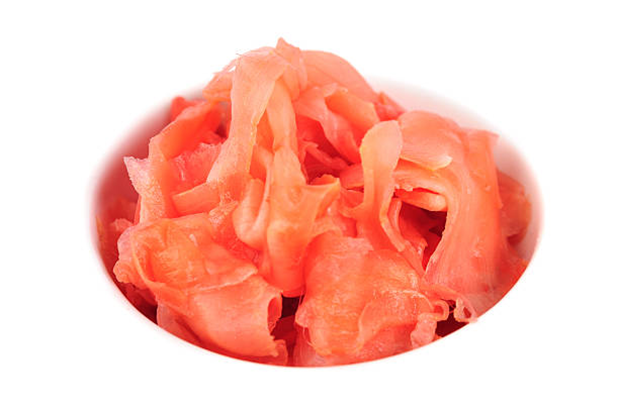 Use a mandoline or very sharp knife to cut the ginger across the grain into super thin pieces. They should be nearly see-through. Toss the ginger with the 1 1/2 tablespoons of sugar and salt. Set aside for 30 minutes to reduce its harshness. Meanwhile, partially fill a small saucepan with water. Ready a fine-mesh strainer and 2-cup (.5 liter) glass jar. In another saucepan, combine the remaining 6 tablespoons sugar, vinegar, and kombu (if using). Set this stuff aside near the stove. About 10 minutes before the ginger finishes mellowing out, start the water pot going on the stove. When the ginger is done, add it all to the boiling water, stir and blanch for 20 seconds to further reduce the harshness. Drain in the mesh strainer but don’t rinse. Shake a few times to expel water, then put into the glass container. Bring the mixture of sugar and vinegar to a boil, give things a stir to ensure the sugar has dissolved. Then pour into the jar of ginger. Push down with chopsticks or a spoon to submerge. Cool, uncovered, then cap and refrigerate. Depending on the ginger, it may be ready to eat in 1 to 3 days. Taste and see. Store refrigerated for months. Posted 9/17/2018 6:11pm by Shiloh Avery. 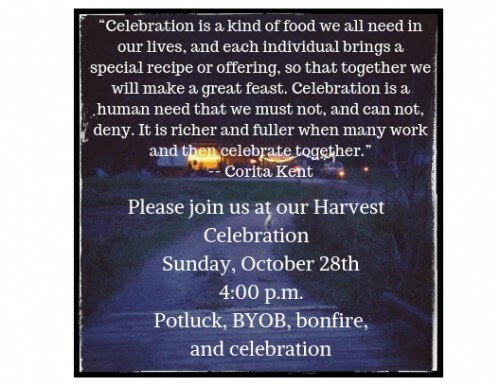 It's time to register for the Fall Harvest Share program! Registration closes as soon as we fill up so don't delay (we're already more than half way full). It’s just 7 weeks this fall, with the first fall share delivery next week September 26th and the last delivery November 7th. It’s a one size fits all share at a $20 value and will include the last of the summer bounty of sweet peppers, lots of lush leafy greens, broccoli, cauliflower, celery, sweet potatoes, tomatoes, ginger, and plenty of salad fixings. The total cost of membership is $140. you can register here. For more information, check out the website or give us a holler! The days ooze by like oil. Viscosity alone moves me through the day. After months and months of intense farm management—trying to hold all the little details in my periphery, I’ve eased into a bit of tunnel vision. My long term and big picture visors have gone up and all I can see is the immediate task list. I just put one foot in front of the other and repeat. I just float along on the liquid days. Turns out, there’s been a lot of liquid in these liquid days, which doesn’t inspire me to move more than my slow plodding pace. The seasons are going to change, the farmily will scatter, the heavy clothes will come out of their closet to wrap themselves around me…all regardless of me. I’m simply trickling along the oil slick of time. Whisk together vinegar, juice, soy sauce, honey, and ginger in a small bowl. Add oil slowly, whisking constantly until incorporated. Put kale in a large bowl. Drizzle with dressing, and mix well. Using your hands, massage kale until softened, wilted, and reduced in volume by about half. Fall Harvest Shares on sale now! Posted 9/10/2018 5:15pm by Shiloh Avery. 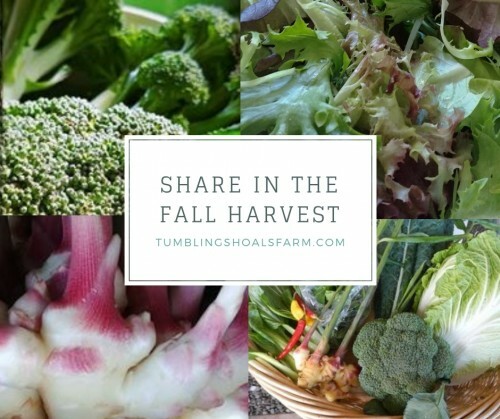 It's time to register for the Fall Harvest Share program! Registration closes as soon as we fill up so don't delay (we're already more than half way full). It’s just 7 weeks this fall, with the first fall share delivery on September 26th and the last delivery November 7th. It’s a one size fits all share at a $20 value and will include the last of the summer bounty of sweet peppers, lots of lush leafy greens, broccoli, cauliflower, celery, sweet potatoes, tomatoes, ginger, and plenty of salad fixings. The total cost of membership is $140. you can register here. For more information, check out the website or give us a holler! It’s September! Nobody even told me! Do you know how I found out? I began to lose focus a little bit. With more or less all the fall planting done, management of the farm switches to mostly harvesting, washing and packing and disassembly. We begin to prepare the farm for hibernation. Aside from the harvesting, washing, packing and markets, the schedules and deadlines get a little fuzzier. Well, that trellis needs to be disassembled but it doesn’t absolutely have to happen today. So I find my mind wandering. I start to read more, hang out with friends more, watch football, think about vacation… I’m just not completely focused on the farm like I am the rest of the season. It was these signs that clued me in to the fact that it is September. Clean up green beans. Snap in half. Heat a wok or large skillet until it is very hot, add peanut oil. When the oil is just beginning to smoke, add the green beans and stir fry for about three minutes. Add Tamari and continue to stir fry green beans while the Tamari reduces to nothing. Reduce heat and continue cooking green beans until desired tenderness. Add additional Tamari or water as needed. Posted 9/3/2018 3:17pm by Shiloh Avery. When my grandfather passed away many years back, we discovered things that my grandmother was unable to do simply because she hadn’t done them in 50 years. She didn’t know how to drive or write a check. Little things we take for granted. I remember thinking to myself that I was never going to let that happen to me. I was going to be self sufficient. There would be nothing that I relied upon a partner to do. 15 years down that road, it seems quite the lofty goal. The reality is, we have partners for more reasons than love and companionship. We have partners because there’s really too much work for one person to manage alone. This is true in running a household and running a business, but it’s especially true for the running of both. Last week, with Jason off hiking in the Smoky Mountains, I found myself in a similar situation to my grandmother’s all those years ago. Each day of his absence I found myself in awe of all the little things my partner does that I barely even notice. I find it daunting to tackle the mountain of tasks that the two of us take on every day. The first to go, for me, is cooking. Jason spends at least a couple of hours each night preparing real food from real ingredients grown here on the farm, not to mention breakfast and lunch. I’m lucky if I manage to stuff a handful of lettuce in my mouth and chase it with a pepper. 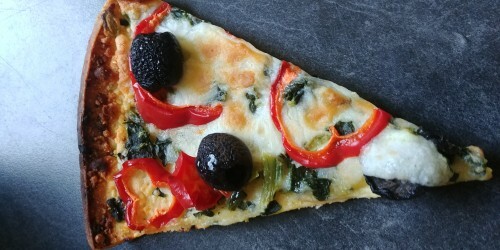 Slice the pepper crossways, place the slice on the pizza with the whole olives. Bake as directed on box. We’re happy to announce that we still have a bit of space left in our Fall Harvest Share program! It’s just 7 weeks this fall, with the first fall share delivery on September 26th and the last delivery November 7th. It’s a one size fits all share at a $20 value and will include the last of the summer bounty of sweet peppers, lots of lush leafy greens, broccoli, cauliflower, celery, sweet potatoes, tomatoes, ginger, and plenty of salad fixings. The total cost of membership is $140. you can register here. For more information, check out the website or give us a holler!